With winter well and truly settled in across Britain, conditions have deteriorated along with the weather. This can cause various delays and unforeseen obstacles, especially if you rely on oil for fuel or to heat your home. It is vitally important to stock up over the winter months to avoid, or at least reduce, any complications that may arise. Maintaining a full tank will help cut down the chances of running out of diesel, petrol, oil or any other fuel and/or materials that you require. Keeping a healthy supply of oil during the winter is a necessity, especially if this is your main source of heating. The colder conditions will undoubtedly see oil usage go up, and the last thing you need is to run out and find yourself unable to acquire more in quick fashion. 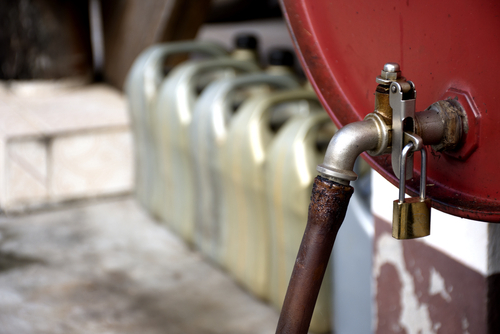 Storing your own spare oil supply will save you time and money in abundance. Investing in as large a storage tank as possible is advantageous when it comes to stocking up. Tuffa’s bunded heating oil tanks can hold up to 15,000 litres (3,300 gallons), almost eliminating the prospect of running dry this winter. Bulk buying your fuel and storing on your own premises, safely and legally, will save you from making a late dash to the garage and getting caught up in traffic waiting for a pump to free up. Investing in one of our diesel tanks will keep your schedule clear, even when having to refuel, enabling you to simply drive up to your own private fuel station and move swiftly on, hassle free. As well as saving you time, bulk buying will see you save money too. While it is important to keep plenty of fuel supplies during the winter months, the wet weather provides ample opportunity to harvest rainwater ahead of the dryer months and any pending hosepipe bans on the horizon next summer. Many people find themselves turning to rainwater harvesting as an effective means of cutting down on costs with water bills rising. This method allows both private individuals and businesses to store their own water supply, therefore becoming less reliant on other resources. If you are unable to find a tank suitable for your own specific needs, then do not hesitate to contact the Tuffa team. We are able to provide a bespoke service and supply tanks for a variety of purposes, including food storage, wood pellets, dog kennels, garden sheds and much more besides.